Despite a flurry of news reports that would seem to indicate otherwise, it’s still possible for Americans to travel independently to Cuba. It’s a crucial message and one that the coordinator of Cuba-US People to People Partnership is seeking to circulate far and wide before serious harm is done to the Cuban economy and private businesses on the Caribbean island. "Americans can still travel independently to Cuba, but Cubans can't come here,” John McAuliff, the organization’s coordinator, said in a statement. In the wake of new travel regulations announced in November by the Treasury Department, news organizations have issued wildly varying reports about the current situation, including stating that all visits must be done through recognized US group-tour agencies and that visits are now limited to tours sanctioned by the US government, permission for which the Trump administration can make as stringent as it wants.Numerous news organizations have erroneously reported that it’s no longer possible for Americans to travel independently to Cuba, said McAuliff. This additional category states that travelers must engage in a full-time schedule of activities that result in meaningful interaction with individuals in Cuba. Renting a room in a private Cuban residence (casa particular), eating at a privately owned Cuban restaurant (paladares) and shopping at privately owned stores run by self-employed Cubans (cuentapropistas) are all examples of authorized activities. However, in order to meet the requirement of a full-time schedule, a traveler must engage in additional authorized Support for the Cuban People activities. The stipulation that individuals participate in activity intended to strengthen civil society in Cuba is an aspiration common to most Americans, said McCauliff, and one satisfied by patronizing the private sector. The Cuba-US People to People Partnership also stated that tour operators may have motive to discourage individual visits to the island, as they take place outside of their packaged programs or cruises. “The unintended loss of independent American travelers is devastating to Cuba’s burgeoning private sector of bed and breakfasts, restaurants and local guides,” states the release from Cuba-US People to People Partnership. Trump’s rollback of Obama-era travel freedoms in Cuba have not been the only damper on tourism to the island. American travel has also been slowed by safety warnings issued in September by the US government, which included the US Embassy in Havana withdrawing 60 percent of its staff. The government has warned Americans of alleged sonic attacks on US Embassy Havana employees. The mysterious attacks have been said to cause individuals to suffer from a range of symptoms including ear complaints, hearing loss, dizziness, headache, fatigue, cognitive issues and difficulty sleeping. The U.S. and Cuban governments have not yet determined who is responsible for the attacks and the Cuban government has denied any involvement, calling the reports bizarre nonsense. “Although the travel warning had no legal force, it created a negative atmosphere for new visitors,” the Cuba-US People to People Partnership said of the safety warnings. Independent Travel Under "Support for the Cuban People"
There is considerable misinformation and disinformation in mainstream and travel media about whether one can still travel independently to Cuba. In effect, "Support for the Cuban People" was expanded to replace the individual People to People License. The only difference is that travelers are expected to patronize the private sector as much as possible for housing, meals and transportation. The political language surrounding Support is virtually identical to both prior and current People to People licenses. To appease Sen. Rubio, intrusive, if not hostile, purposes are listed as alternatives to a personal commitment to full time engagement with the Cuban people. The crucial word for both licenses is "or". For group travel the organizer is responsible for content and keeping records; for independent travel alone, or with family or with friends, the traveler(s) are responsible. The bottom line is that independent travel is most supportive of the growing private sector in Cuba. It is at least as engaging with the Cuban people as prestructured group tours, especially if a local guide is hired. It certainly does more for the participant and for Cuba than cruises, a fully authorized mode of travel. "Travel: Symbol of and Vehicle for Change"
When I proposed this topic, I expected to be able to describe an uneven progression towards near normalcy for travel between our countries. However, events of the past six months have muddied the waters and the future is harder to chart—unless you are a cruise line, the least people to people but a completely authorized mode of travel. Before the revolution in 1959, Cuba was the primary Caribbean destination for Americans and we provided 80% of its visitors. Being able to drink legally during prohibition was certainly an early attraction, but Mafia investments in hotels, gambling, drugs and prostitution transformed the destination in the 1950s. At least as important were the same attractions that bring millions of visitors today: history, culture, baseball, beaches and the engaging people of Cuba—plus the ease of arrival whether by air, cruise line or by ferry. “we in Cuba are very happy and grateful to you for honoring us all with your presence … please put all your political ideas aside. You and your friends are professionals, not politicians, and your mission is to help your friends find the happiness our world may provide. For just that reason, the threat of reality overcoming propaganda, the end of US tourism was a major and, for many years, a successful goal of the embargo. 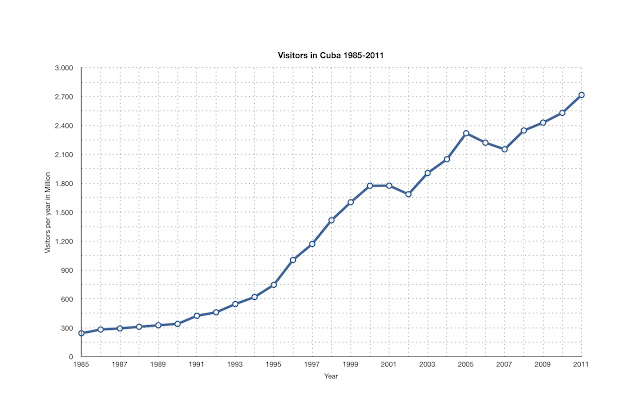 It dovetailed with Cuba’s disinterest in tourism in the initial decades of the revolution. As the country’s turn toward socialism faced growing threats from the US, Fidel’s early enthusiasm apparently cooled. Tourism flourished domestically, but until the mid-1970s foreign visitors were largely welcomed from politically aligned countries or movements, either as vacation rewards or as demonstrations of solidarity. Conventional tourism was seen as carrying the subversive seeds of social inequality. Cruises received special denigration. Entry to Cuba was also discouraged by obstacles created by neighbors who followed the US goal of isolating and undermining the revolution. I remember that on my first trip to Cuba in 1971 even Mexico only allowed us to transit by air to Cuba but not to return. As a result we went home via a freighter to Canada in the dead of winter. From the beginning, there were people who ignored the travel embargo, either acting in solidarity with the revolution or simply because they resented US government infringement on their personal freedom. The Office of Foreign Assets Control chased after violators, penalizing them with fines and intimidation, notably through constant repetition of overstated legal risks in newspaper articles. Individual travelers were most vulnerable, often settling for payment of reduced fines rather than risk criminal prosecution. 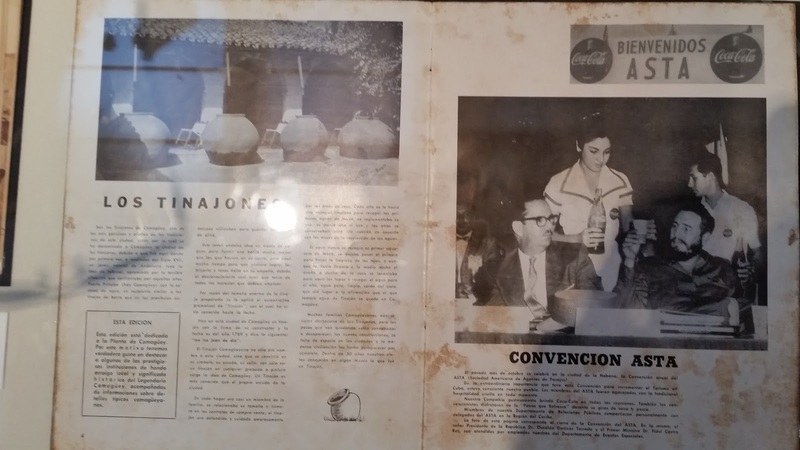 Probably the first US NGO to send visitors was Sandy Levinson’s Center for Cuban Studies in 1973. Its delegation of lawyers used the loophole of being fully hosted by Cuba. The Venceremos Brigade and later Pastors for Peace famously defied the travel embargo with little consequence. President John Kennedy imposed travel restrictions in 1963 and President Jimmy Carter let them lapse in 1977, the same year that Interest Sections were opened in both capitals. However, the opportunity for a breakthrough was missed. On the Cuban side there was not the political interest or capacity to open the door to commercial tourism from the US, nor did US companies take advantage of the opportunity. President Ronald Reagan reimposed restrictions in 1982. The change of perspective on the Cuban side began in the mid 1970s, but dramatic change is linked to the collapse of the Soviet Union and the need to obtain new sources of national income during the Special Period. A growing stream of Americans illegally joined the stream, flying from Mexico, Canada or Jamaica and usually escaping sanction. However, legal travel for a diverse clientele only began in the Clinton Administration. Clinton did not believe he had the authority to unilaterally end the embargo with Cuba as he had with Vietnam, but he could provide categories of licensing to provide exceptions. Thus began the process of applying to OFAC for approval of a specific license on a trip by trip basis. Initially that was not so complicated and my organization was one of many to do so, even without using a lawyer. Cuban Americans were allowed to visit once a year, plus for humanitarian reasons, but no effort was made to enforce that limit. It was not lost on the hard line ultras among Cuban Americans that the negative propaganda about their homeland was losing effect as more and more mainstream Americans personally witnessed and even enjoyed a more complicated reality. Regardless of whether visitors admired or despaired of Cuba’s political and economic system, they came home convinced that the Cuban people did not hate Americans and the embargo was dumb. The tactic adopted by the ultras to challenge Clinton’s opening was Brothers to the Rescue. It used a humanitarian mission of saving refugees at sea to mask deliberately provocative flights dropping political leaflets over Havana in blatant violation of national airspace. One can argue that Cuba had no alternative in defense of its sovereignty, or that it swallowed the bait of Miami. In any case the political reaction in the US to the shoot down of the Brothers to the Rescue planes led to Clinton’s support of the infamous Helms-Burton legislation and no greater opening of travel based on executive authority. In 2000 the legal authorization of agricultural sales was paired with the codification of categories of permitted purposeful travel. Although President George Bush took power with the help of Cuban American interference in the vote count in Florida, he initially made little change in Clinton’s travel regulations. There was considerable bipartisan momentum in Congress to find ways of ending travel restrictions. The Miami ultras response this time came via allies in the Administration. James Cason, the head of the US Interests Section, had been directed by superiors in the State Department to create enough provocations to push the Cubans to close it. His notoriously direct and public engagement with US government supported dissidents led to a large number of arrests and controversial trials that were labeled as the Black Spring and widely denounced in the US and Europe. Again Cuba could be seen as defending its sovereignty, but the political consequence in the US was the total collapse of Congressional efforts for freedom of travel and agricultural sales, much to the satisfaction of the ultras. As President Bush approached his reelection campaign, he paid his political debt to Miami, drastically restricted travel licenses and limited Cuban Americans to one trip in three years with no humanitarian exceptions. However by 2007, enforcement was virtually stopped because the appeals process had ground to a halt. Violations by Cuban Americans were completely ignored except when a company tried to profit from them. When President Obama took office, he brought an anti-embargo disposition but also political caution of how fast he could proceed. As promised during his campaign, and despite pressure from some Cuban American supporters, he fundamentally transformed the relationship between the Cuban diaspora and their country of origin in April 2009, an approach welcomed by the government in Havana. He ended all restrictions on their travel and on remittances, permitting a process of grass roots family investment that fit well into the new Cuban reality outlined by the Lineamientos and the initiatives of President Raul Castro. There were news stories at the time that Obama also was considering opening travel for the rest of us but the White House acceded to pressure from Senator Menendez. He did restore the definition of categories from the Clinton era in January 2011. There was a boom in licensed group tours, but OFAC created arbitrary and politicized obstacles in both the application and renewal processes that limited most access to those with expensive legal support. During this time, my organization was denied a license five times until Senator Leahy’s office intervened, at the same time it also successfully challenged unduly bureaucratic renewal requirements. The ultras weapon this time was USAID democracy programs that their allies had rushed to create in the closing months of the Bush Administration but that were implemented during the ignorant or uncaring tenure of Hillary Clinton as Secretary of State. Among them was the contract received by Alan Gross to set up a network of satellite linked internet communications. Instead of apologizing for and terminating such programs, Clinton played into the hands of the ultras making Gross’s imprisonment a human rights cause celebre and an obstacle to any further opening. Her position that the US had the right to unilaterally sponsor projects in Cuba naturally inflamed Havana’s sensitivity to infringement of sovereignty. The issue became more complicated when Cuba chose to link the release of Gross to freedom for the Cuban Five. One can only speculate what the consequences might have been if the Gross issue had been quickly resolved through mutual compromise and Obama had opened the door to wide scale travel in his first term rather than waiting until January 2015. The decisive transformation made by Obama at that time was to turn the Clinton categories of specifically licensed travel into self-governed general licenses, removing all bureaucratic impediments of an application process. That enabled virtually any group or travel business to organize its own trip under the people to people general license. The description of purpose and internal administration of group trips was not changed, but absent a requirement for applications and renewals was virtually unenforceable. The separate licensing of travel providers as OFAC police was also ended. 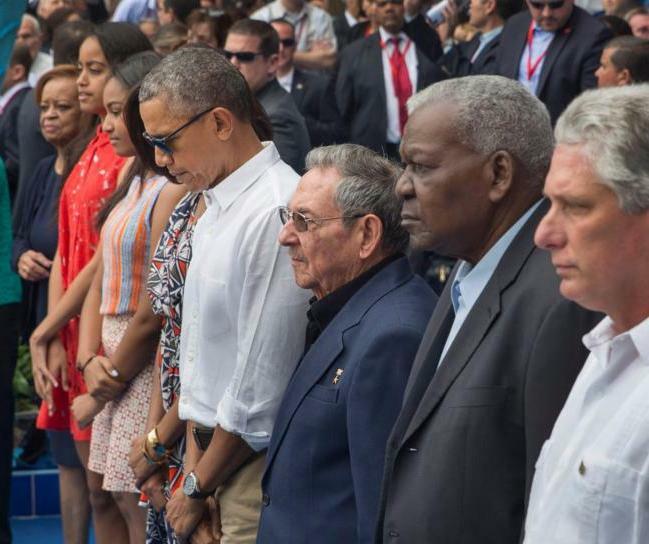 A moment of silence for victims of terrorism in Europe before the US-Cuba baseball game. The final step of Obama on March 15, 2016, was to permit individuals, families and friends to organize travel independently under the individual general license for people to people travel. This dramatically opened travel to Americans who could not afford or disliked group travel—or who wanted to share Cuba with their children. A natural consequence was the increase of business for Cuba’s emerging private sector of casas particulares and paladars and their support enterprises, thanks to dramatically reduced costs and the convenience of direct credit card payment on line in the US to AirBnB and for commercial flights. At this stage one could say travel had become nearly normal, excepting only all inclusive beach holidays. The character and goals of the Trump Administration are a dominant theme of this conference, but their confused character is well illustrated by travel. Some of us had been optimistic that Trump would leave alone or even expand Obama’s initiatives. His professional involvement in the leisure industry had led him to fund an illegal sounding in Cuba and a legal delegation to discuss golf courses and hotel. A participant in the second trip, the Trump Organization’s counsel, Jason Greenblatt, whose father or father in law emigrated from Cuba seemed will disposed toward normalization and had been given a special portfolio on Cuba in the new Administration. Even when Trump gave an anti-Obama red meat political speech in June in Miami, the changes he proposed in travel were substantively minor. Untouched were virtually all forms of travel, including group tours, cultural exchanges (such as the Irish traditional music and dance performances we undertook last month in Holguin and Santiago) and the most touristic kind of interaction, cruise ships. His attack on hotels under GAESA could be easily countered by restoring Habaguanex to the Historian’s office, reopening most of the banned facilities used by Americans in Habana Vieja. His destruction of the individual general license was already being minimized by hints of an opening of a new path for independent travelers under a different license category, Support for the Cuban People. Despite this reality, the number of US visitors has plummeted. In part that is due to the political climate. Hostile words, even from an unpopular and morally discredited President, change the atmosphere for uncertain travelers impacted by half a century of hostility and mistrust. The drawdown of US diplomats procedurally required a completely unjustified travel warning because of the limited capacity to provide services to US citizens. In addition to the psychological impact flowing from half a century of negativity about Cuba, a travel warning triggers insurance and legal prohibitions on university, business and other institutional travelers. The New York Times, for example has already canceled three months of group tours to Cuba because of diminished interest and canceled reservations. Why would its affluent and relatively well informed clients have been so easily scared off? We still don’t know whether the new tactic by Cuban American ultras to block travel and reverse normalization was the mysterious illness said to have afflicted US government personnel in Havana. If Cuba’s apparent position that nothing actually happened is correct, the fact that the original targets were reportedly US intelligence operatives could mean they were conspirators in a planned disruption of relations. Or their covert identity could mean they were a deliberate target of some non-Cuban force opposed to normalization, for example North Korea which shows little regard for international or diplomatic norms. In any case, it is certain that the ultras quickly moved to exploit the situation. Senator Rubio and four colleagues had called for the US to close both embassies a few days before Secretary Tillerson withdrew 60% of staff, perhaps to prevent worse. Rubio and Rep. Diaz-Ballart also criticized the revised travel restrictions as having been subverted by the bureaucracy so their game has not ended. Despite the State Department’s apparent intention to make Support for the Cuban People a replacement for the individual general license, the published language, although modified favorably, was open to misunderstanding or deliberate misinterpretation for reasons of economic self-interest or politics. In my view if the goal of travelers is to promote independent activity to strengthen civil society and their activities enhance contact with the Cuban people, with the result of meaningful interaction, their presence in Cuba will be seen positively as legitimate support for the emerging private sector, they qualify for this general license and they will be welcome visitors. If they are motivated by the other listed goals and act on them, their presence could be regarded as intrusive and not respectful of Cuba's sovereignty by authorities. The same can be said for still legal group people to people tours which are encumbered by the same presumptuous language. The ultras no doubt welcomed the effective termination of US visa granting authority as the result of withdrawal of diplomats. They are spared the permanent addition of at least 20,000 Cuban immigrants annually, most of whom will eventually become anti-embargo voters, and of tens of thousands of non-immigrant visitors who deepen personal links across the straights. No doubt the ultras are hoping that the drastically diminished utility of the embassy, combined with the possibly provocative choice of a new charge d’affairs who was expelled as US ambassador to Bolivia, could lead Cuba to righteous actions that will be used to justify termination of diplomatic relations. If in fact the Trump Administration strategy is to make the embassy a facade as was charged this morning, the effective Cuban response would be to make it more real by constantly inviting participation by US diplomats in broader aspects of Cuban society than has been the case. We have two reasons to hope: First, Cuban Americans and US academic organizations could start complaining vociferously about the end of visas and hold Rubio and Diaz-Ballart personally responsible. Second, if the Democrats take back the House of Representatives in 2018, they can join a majority of Senators to end legislatively all travel restrictions. Then we will see whether President Pence or Ryan will veto their action. (b) General license for people-to-people travel. My layman's interpretation: if a travelers’ view of their goal is to promote independent activity to strengthen civil society and their activities enhance contact with the result of meaningful interaction, their presence in Cuba will be positive in support of the emerging private sector and they qualify for this general license. If they are motivated by the other listed goals and act on them, their presence could be regarded as intrusive and not respectful of Cuba's sovereignty. Bringing artists to the U.S. is never an easy task. It’s all the more challenging when those artists live in a country under embargo by the federal government. The promoter of this weekend’s Cuban music and arts component of the arts festival Pacific Standard Time: LA / LA found that out the hard way. A few months ago, the process of acquiring visas for more than two dozen Cuban musicians was going smoothly, said event curator Betto Arcos, who has been promoting world music performances in Los Angeles for years and hosted the “Global Village” world music program for seven years on KPFK-FM (90.7). The musicians — hip-hop artist Telmary, Afro-Cuban jazz drummer Yissy Garcia and tres guitarist Pancho Amat, plus their bands — had submitted petitions for visas through the Department of Homeland Security. All but three of 26 applications were approved. But following a mysterious series of incidents deemed “specific attacks” causing hearing loss and other unexplained illnesses for numerous Americans posted in Havana, more than 20 U.S. Embassy employees were called home from Cuba in September. One result was that the process of granting visas slowed to a trickle. Even though their visas had been approved, the musicians Arcos was trying to bring to Los Angeles were unable to acquire them in Havana, putting the three-day “Cuba: Antes, Ahora/Cuba: Then, Now,” festival that opens Thursday in jeopardy. Through a series of creative moves, and with some assistance from John Feeley, the U.S. Ambassador to Panama, all three headline performers have procured their visas and will appear as scheduled at the festival’s free Friday night program, Sleepless: The Music Center After Hours, which will fill the Dorothy Chandler Pavilion with sound and visual installations, art displays, film screenings and live music, as well as at Saturday afternoon’s free Rumba Dance Party + Jam Session in Grand Park. Garcia is bringing her regular five-piece band, Bandancha, and Amat will travel solo, performing with an L.A.-based Cuban ensemble that specializes in the same traditional son music that Amat plays at home. “Yissy Garcia, just by chance, was on tour in Argentina, and we got them to stay a little longer,” Arcos said. That’s when he put in a call to ambassador Feeley, whom he’d met years earlier in Washington D.C., before the diplomat was appointed to his post in Panama in 2015. Feeley helped Garcia and her five-piece group get appointments at the U.S. Embassy in Buenos Aires in time to get their visas in hand before returning to Cuba. Telmary, however, volunteered to use some of the fee she would get to perform in the U.S. to travel with several of her band members to Mexico. She was able to get her visa and those of about half her band from the U.S. Embassy there. She’ll perform this weekend with additional support from three L.A. musicians, two of whom are Cuban. Amat, however, is coming alone, even though in Havana his band includes a guitarist, two percussionists, a bassist, two singers and a trumpeter in addition to himself on the tres, one of the signature instruments in Cuban son music. The tres has six strings like a standard acoustic guitar, but they are strung in three pairs, each doubling notes an octave apart, akin to the more common 12-string guitar. The tres, which is native to Cuba and originated in Guantanamo, can cut through the sound of a large ensemble to add a shimmering, vibrant dimension to the overall sound. Through a bit of serendipity, Amat will perform with an L.A.-based son ensemble led by another Cuban tres player: San Miguel, who immigrated to the U.S. years ago. Each group highlights a different strand of Cuban music, fulfilling Arcos’ mission in putting a varied Cuban music and arts program together. It opens Thursday at the Annenberg Space for Photography in Century City, which currently is featuring an exhibition about Cuba. At 7 p.m. Arcos will conduct a ‘Then, Now’ question-and-answer session with Amat, followed by L.A.-based Cuban flutist Danilo Lozano interviewing Garcia, then African American composer and musician Dexter Story in a talk with Telmary. On Friday, all three bands will perform at the Dorothy Chandler Pavilion’s late-night session running from 11 p.m. to 3 a.m., also featuring guest DJs. Saturday’s jam session in Grand Park downtown will be led by a rumba group from Havana with appearances by Garcia, Telmary and Amat and other guests. The festival concludes Saturday night when Cuban dance ensemble Malpaso performs at the Dorothy Chandler Pavilion with musical accompaniment from the New York-based Afro Cuban Jazz Band led by Arturo O’Farrill, whose father, Chico O’Farrill, was one of the pioneers of Afro Cuban jazz in the late 1940s, ‘50s and ‘60s. Arcos expressed disappointment over the Trump Administration’s recent decision to pull back on the steps President Obama had taken to improve relations with Cuba, following nearly 60 years of the cultural, trade and travel embargo imposed after Fidel Castro’s populist Revolution installed a communist government on the island in 1959. That debate is likely to continue in the years ahead, but for now, Arcos’ focus is on what’s looming this weekend. An opportunity to combine the freedom and spontaneity of the new general license for individual travel with a structured program that introduces you to Cuban history and culture in the country’s vital east end, and the past and current role of the US. Bed and breakfast private housing and intercity transportation will be coordinated by the organizers. The majority of lunches and dinners and consumption at evening events will not be included. Enjoy the place that Cuba’s traditional music originated, including Tumba Francesa and the Museum of Changui. We are requesting a visit to Caimanera, the town that adjoins the Guantanamo base, with a briefing on Cuba’s view of US occupation. Scheduled visits will be included in cost for all participants but they can, by notifying the organizer, choose to opt out of any segment and take personal responsibility that their planned activity qualifies under “support for the Cuban people”. The individual option is not available during intercity travel or stops en route. We strongly recommend that each participant, couple or family bring an unlocked quad band GSM phone and purchase a Cuban SIM card in order to combine independence and group maintenance. A parallel program is available for people to people tour groups that prefer hotel accommodations. * If this approach is not accepted by Cuban authorities, we will organize a conventional group tour. “Travelers can continue visiting Cuba legally,” says Peggy Goldman, Founder and President of Friendly Planet Travel, a U.S. tour company. But if they book their tickets or hotel stays online, they will need to provide proof that they fall under approved categories of travel. Alternatively, visitors can visit the island with operators like Educational Experiences Abroad, Friendly Planet Travel or Cuba Educational Travel. Although still legally allowed to enter the country, individual Americans must travel with a licensed “people-to-people” group tour. Group tours are required to provide a full-time schedule of educational exchange activities, and an employee of the tour company travels with each group to certify that the schedule is maintained. 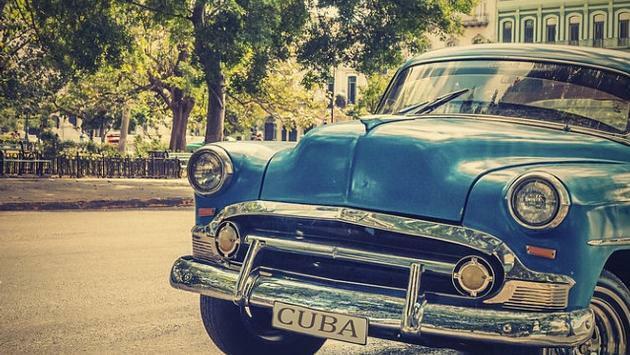 Cuba in past years has appeared on USTOA’s surveys as an emerging destination; this year, however, it appeared on the list of those places “at risk,” that travelers should see now. Referring to Donald Trump’s recent executive order regarding travel to Cuba, USTOA’s Dale noted that tour operators running escorted programs in Cuba are not affected; however, those who want to do FIT, or independent travel, to the island are. Dale also cautioned that airlines that had previously added service to Cuba may drop it now that the ability to travel there has been diminished. “If they can't fill their seats with individuals and groups, they may pull service. Alaska Airlines pulled their service as an example, and some service was cut back from other airlines, so there are implications to all actions that could affect Cuba, so it's kind of a double-edged sword,” he added. Dale said USTOA has done some lobbying regarding Cuba travel; however, he admitted he’s not optimistic about the outcome, considering all of the other issues facing Washington, DC. Trump began the rollback on June 16, with regime-change rhetoric and a new directive curtailing the ability of individual US citizens to travel to Cuba..... Now, all non-academic educational visits under the “people-to-people” licenses must be done through a recognized US group-tour agency. This last point is key, as the individual people-to-people category was the one most commonly used by Americans visiting the island; it was the easiest to obtain, the cheapest way to visit Cuba, and the one that offered the most freedom to travel around the island....The fact that US citizens must now travel under the auspices of a US tour company hurts me and others economically because now we are limited to being subcontractors, and no longer have the ability to work with clients directly—if at all. Now, tourists can only visit Cuba ”under the auspices of an organisation subject to US jurisdiction” while they must be accompanied by a US representative of the organisation. Thus, the only means of travelling to Cuba for Americans is through an organised trip. According to the new rules, “people-to-people” exchanges are banned. Americans who want to meet Cubans will now have to travel in groups accompanied by an authorized representative of the trip’s sponsoring organization. Now Americans who want to visit Cuba will again be limited to tours sanctioned by the US government, permission for which the Trump administration can make as stringent as it wants. Numbers will drop precipitously. -- from an article in the New York Review of Books by Nik Steinberg who served as counselor to the Obama Administration's UN Ambassador Samantha Power. As we noted before, the most important policy change with regards to travel is that U.S. travelers can no longer travel on their own under the broad ‘people to people’ category without going through an authorized travel provider like Global Exchange Reality Tours. Individuals can travel under the Support for the Cuban People Category. This means that anybody can visit Cuba if they spend majority of their time interacting with the Cuban people, supporting the private sector, and supporting civil society (donating to church, synagogue or community program or offering information to entrepreneurs). Cuba Educational Travel assists individual travelers in complying with this category, so you can carry out your own itinerary but comply with the law.